induces platelet activation and aggregation. 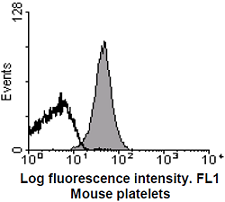 immunofluorescent staining, and Western blot analysis under non-reducing condtions. HRP-conjugated anti-rat IgG and ECL. Analytics, P190-1, black line) or JAQ1-FITC (shaded area) for 15 min at RT and analyzed directly.